Easily transform your voice files into text. Transfer your single-speaker recorded audio files to your PC to generate a written transcript using Dragon. It's as easy as record, transfer and transcribe. 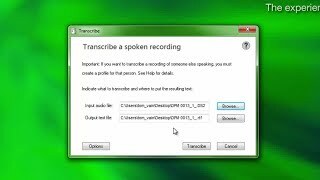 It’s easy to transcribe your recorded speech into text using Dragon. Simply establish a user profile for a digital voice recorder, and then speak your notes or memos and have Dragon automatically transcribe your recorded voice when you connect to your PC. With the all-new Dragon Professional Individual, v15 you can even transcribe another single speaker’s voice from pre-recorded audio files or from podcasts—without having the speaker present to read a passage for training. It’s fast, simple and accurate. Increase productivity. Use a digital voice recorder and dictate reports, notes or memos away from your desk or out in the field for later transcription using Dragon. Record a lecture using a digital recorder or mobile device and download the audio file to your PC. Processeur : Intel® double cœur ou processeur AMD équivalent.Plus le processeur est rapide, plus les performances sont élevées. Systèmes d'exploitation pris en charge : Windows 7, 8.1, 10 (32 et 64 bits) et Windows Server 2008 R2 et 2012 R2. Remarque : cette version ne permet pas la dictée dans un système d'information médical. Pour bénéficier de cette fonction, choisissez plutôt Dragon Medical Practice Edition.